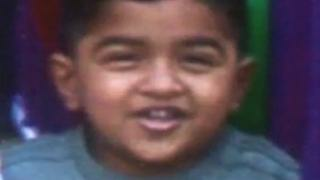 The parents of a seven-year-old boy have appeared at Cardiff Crown Court in connection with his death. His mother, Sara Ege, 33, denies beating Yaseen Ali Ege to death at their home in Pontcanna, Cardiff, in July 2010 and setting fire to his body. The boy's father, Yousuf Ege, 38, denies a charge of causing the boy's death by failing to protect him. The pair wept silently as Ian Murphy QC, prosecuting, explained the circumstances. The trial continues. The jury was shown a piece of wood which the prosecution claims was used by Mrs Ege to hit her son "like a dog". Mrs Ege covered her ears as jurors heard the 999 call she made saying that there was a fire in the home and that her son was still upstairs. The court heard firefighters found Yaseen on the landing and he was taken to the University of Wales Hospital in Cardiff where he was pronounced dead. It was first thought that the boy had died in the fire and that his death was a tragic accident, the jury heard. But a post mortem examination revealed he had died several hours before the blaze, of multiple injuries caused by being hit by a blunt instrument. Sare Ege admitted she been hitting Yassen with a stick, in her own words, "like a dog," for three months before the fire, the court heard. The prosecution claims that she beat him so severely on the day of the fire that he died. It was also found that the fire was started deliberately, the court heard. Mrs Ege admitted pouring lighter fuel over her son's body, the jury was told, saying "I know he was gone but I was just trying to protect myself".